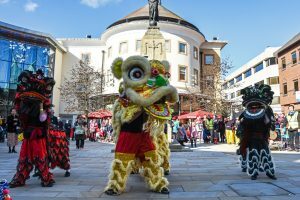 WOKING town centre was transformed into a mini-China Town for the Chinese New Year celebrations that attracted more than 1,000 spectators. Residents of the borough and beyond were treated to a colourful parade last Saturday, followed by the Lion Dance and other performances, including displays of martial arts. a large number of stalls in Mercia Walk, selling food and crafts and displays of Chinese art and calligraphy. Visitors were able to try their hand at traditional games and take away a card with their names written in Chinese script. For those keen to get out of the chilly outdoors, there was Chinese story telling in the library. The main event, welcoming in the Year of the Dog, which began last Friday, was the programme of performances in Jubilee Square. It began with the Lion Dance, which is intended to bring good luck. The huge colourful costume is operated by two dancers, unlike the Dragon Dance, which involves a larger number of performers. Samuel Lee, the master of ceremonies, explained the significance of the various aspects of the programme, including the Money God who walked around the square giving out lucky sweets to children.